The Italian White Truffle, also known as the Alba White Truffle, is revered the world over as the ultimate in culinary indulgence and luxury. Found exclusively in Italy & Croatia they typically grow among oak, hazel, poplar, and beech trees. 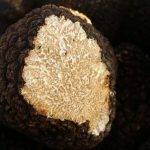 Their unique and celebrated aroma has captured the imagination of chefs all over the world and this truffle is considered the diamond of the kitchen. They are best prepared grated minimally over pasta dishes or traditional Italian Cuisine. 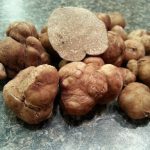 They are a white truffle with a marbled interior and are prized for their complex umami aromas that are unique unto themselves! When you think of truffles– this is it! Italian white truffles are generally harvested September through the end of December. Italian white truffles can range in size. For larger or icon class requests please contact us directly. We recommend this product is consumed as soon as possible, within 1 week. If stored properly they can have a longer shelf life, but aromatics decrease with time. 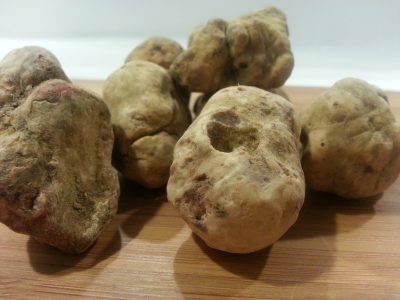 All Italian white truffles are listed at Market Price. Please inquire for current prices. Please note that this product MUST be shipped overnight via Fed Ex or USPS. We are currently experiencing a glitch in the system so please select “LOCAL PICKUP” as your shipping option upon checkout. We will separately invoice for overnight shipping. Domestic Shipping via USPS is approximately $35 per shipment for anything under 4 ounces to most locations. Fed Ex prices will vary depending on weight and location. Please consult us for a quote if you’d like prior to purchase. We apologize for the inconvenience and are working to solve the problem. Wholesale and bulk pricing is available.